The 13,000 and 14,000 foot peaks that surround Telluride fill the San Miguel and Dolores rivers in the Summer. From late May through the end of June the rivers swell with thousands of gallons of snow melt, providing class II-III+ whitewater. The San Miguel River begins in the San Juan Mountains above Telluride, and after traveling through the Town of Telluride, travels another 80 miles to the confluence with the Dolores River. One of the few remaining ecologically and hydrologically intact river systems in Colorado, the river provides views of scenic canyons and desert before it ends at the Dolores. 6 miles downstream of Telluride, this 12-mile route provides long sections of constant class III rapids and class III+ whitewater. Sawpit Rapid (III) requires straightforward maneuvering with an abundance of eddies. Just 30 minutes downstream of Telluride, this 9-mile route is ideal for beginning and intermediate rafters, families and groups of mixed ability. 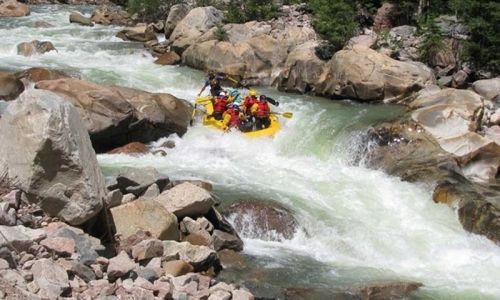 Starting high in the San Juan Mountains, the Dolores River travels approximately 250 miles before it ends at the confluence with the Colorado River in Utah. The most popular routes are below McFee reservoir where the river gains speed as it flows through deep canyons and scenic desert. The 19 mile, class II-III+, section from Bradfield Bridge to Dove Creek Pump Station features gently sloping canyon walls leading into deeper sandstone canyons. The section is perfect for a day trip, or the start of a multi-day trip to Slickrock. This 28 mile section from Dove Creek Pump Station to Slickrock provides class III rapids, and Snaggletooth (IV-V) rapid featuring a quarter mile of whitewater. This section provides goosenecks of sandstone canyons with mostly class II rapids. Half day, Full day and Overnight trips are available.